It’s a glorious day. The day after our Canada Day BBQ, rather. Yowza! I’m sitting under the pergola on our party deck being buffeted by winds that will, in a short while, bringing slashing rain and probably thunder. The scents from the blossoms on the Korean lilac tree behind the new garden shed and the bunches of peonies on the table in front of me fill my head with sweetness. The sky has turned that bilious blue and the darkening clouds are blowing in a different direction than usual. The leaves on the trees are turned inside out and then everything grows eerily still for a few minutes. Even the bloody Internet connection is acting weird. But then again we have Rogers ‘service’ and that’s no surprise. I guess the bandwidth will continue to degrade as the kids home for the summer get online to feed their Facebook addiction and play games. Drives me nuts when I have something time-sensitive to do. No matter. First world problem. 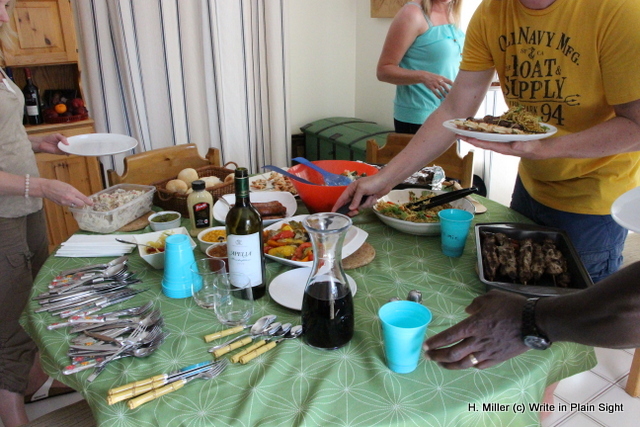 Yesterday’s Family & Friends barbecue was stellar. Ten adults and five children. It was very hot for the first couple of hours – the sun was high in a clear sky empty of cloud cover. The bocce game didn’t hold anyone’s interest for long – too sedate, I guess. The lawn this year is still soft and lush, unlike last Canada Day when it had already turned to straw under the relentless dessert heat and the temperature on the deck was over 40 degrees. The kids ran through the sprinkler, kicked around a soccer ball and tossed Frisbee rings in between doing gymnastics moves and wrestling one another. The grownups nibbled appetizers and got caught up – of course, as with any party, we were clustered closer to the hot grill under the table umbrella instead of in the cooler shade of the lower deck. Happy, happy, happy. 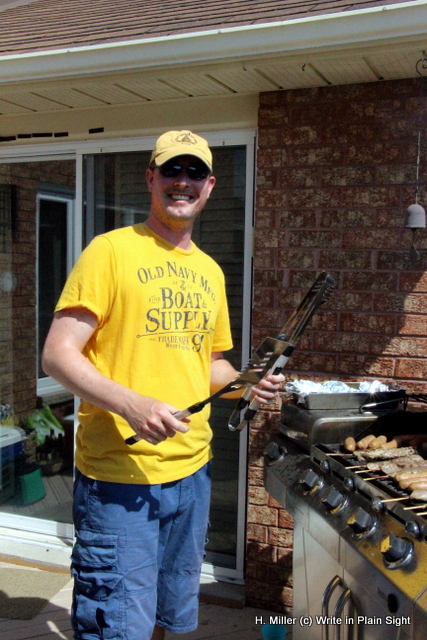 Jamie, chef extraordinaire, mans the smokin’ hot grill. I’d bought one of those drink dispenser thingies at Costco – for $19, how could I go wrong? I froze plastic containers of half-diluted juiced with orange slices and mint garnish form the garden and filled the thing up. It was a lifesaver – kept the kids out of the fridge and our pop supply, saved the ice for grown-up drinks and kept the kitchen clean. Everyone marked their names on cups with a Sharpie, which kept the recycling to a manageable level. We sampled some fantastic beers of the world and had enough food on the tables to feed a small village. Greek white wine with dinner. Jerk chicken, kebabs, shrimp skewers, German potato salad, Greek salad, rolls, five different kinds of fresh and smoked sausages, sesame stir-friend skinny noodles, grilled peppers and onions. Thank goodness for Ziploc bags – there were lots of leftovers to be shared. I had baked some applesauce cupcakes with cream cheese cinnamon frosting for dessert (homemade applesauce kept them very tasty and moist). But Jamie (he’s really a chef at heart) topped that with his dessert offerings. Fresh homemade Belgian waffles served with Ontario strawberries, maple syrup, vanilla ice cream and whipped cream. The company was a nice mix of younger and older folks. Family and friends we care for. The kids shared one table and the adults another. We told lots of stories. We laughed until our cheeks hurt. What made it even more special was that everyone pitched in before, during and afterwards. Hub and I had a minimum of post-party chores. Everyone had a good time, which was the intent of the event. Maybe we’ll do it again for Labour Day.